Stop searching for the right answer or the perfect tip to show up. This is the reason you’re stuck. Yep, it’s hard to swing freely when you’re lacking confidence or not sure, but this is exactly what you’ve got to do. Swing the sticks. And do it now. Waiting for “perfect” to show up is tempting but you’ll be waiting for a long time. You’ll miss out and regret the time lost. Hit that ball. Shot by shot. Putt after putt. Feel what is happening. Experience your thoughts and emotions and you will get better. It may be a slow process but it certainly beats standing still (or going backwards). Don’t let slow fool you – if you’re moving forward you’ll often be quicker than the alternative. Go play. Enjoy. Forget about the consequences and repeat. A better game is just waiting to be let out. over and over again that it gives you the best oppurtunity to play golf. The week before I shot 91 at Howlong. I ididn’t stick to my routine. When it does happen the feeling of success YOU KNOW that you are playing well. This is when the nerves and adrenalin kicks in it’s imperative not get distracted with score or future events. Just stick to your routine. If you give Pesky an ear he will utterly destroy any oppurtunity of you completing a great round. So to quiet him/her stick to your singing/humming or counting. This is your rod and staff to playing great golf. Steady: I believe the routine is more mental. You can almost do what you like with your practice swing and other movements. The mental part of your routine is almost non negotiable. Either you prepare yourself to hit the ball and play the game or you’re stuffed. 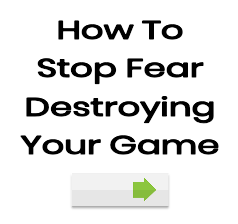 Learning to strike the ball without fear, worry, concern is the most important skill a golfer will learn. From here anything is possible. Putting break through today, 27 putts, my secret was to use a different putter and a new routine. Sick of beating your head against a wall, then change your approach. For the last 20 games previous I was averaging 37 putts, loooossssserr. But above all it was my mental routine that I stuck with all day just visualising that little white ball following a path into the cup and ultimately I was enjoying the process and not concerned with the result. Cam280: Yep, this is a breakthrough. The new putter can help clear your mind but the big thing was a better attitude. Your approach was simple and hopefully something you can repeat time after time. At the end of the day all you’re doing is rolling the ball across the grass – and if you can enjoy the process you’ll naturally get better and better. Well done! GP: I got that from my Pop. He never played golf but always asked me if I was still “swinging the sticks”. Would make a good title for a book that’s for sure. You have to keep moving forward and sooner or later the golf swing will come. There is no perfect tip but lot’s of practice solves all problems.